Our Dogs Annual is the world’s most famous publication of its kind. A fantastic A4 glossy 500 plus page year book. See our features list packed full of breed features, trade features, show reviews & previews plus much more! 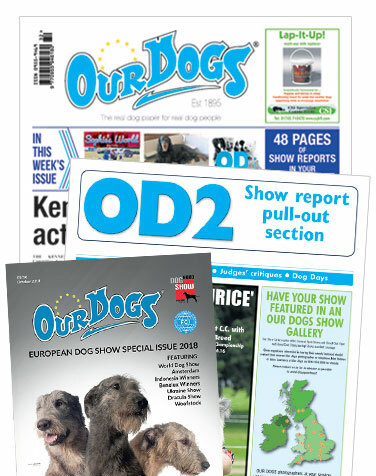 Our Dogs "The dog paper for real dog people" Seen by top breeders, handlers, judges & show organizers in the UK and throughout the world each and every week! The OUR DOGS ANNUAL is the world’s most famous publication of its kind. We are currently taking Breeder, Exhibitor & Trade advertising for the Annual. All pages are in full colour & on glossy paper! See the link below for more. See our latest features list - packed full of breed features, trade features, show reviews & previews plus much more! We have been continuously publishing the Our Dogs Newspaper since 1895 and have had an online presence since 2001. Our depth and knowledge of the industry is unsurpassed, with the weekly newspaper and website being invaluable to our readers & viewers. Take a look at a our Digital Page Turning Edition! Click the arrows below to scroll through each advertising section. See what Our Dogs has to offer. We have many services and products that are dedicated to meet your advertising needs! The leading canine weekly has been published continuously since 1895 and available each Friday. A fantastic A4 glossy 500 plus page book that is eagerly anticipated every December - Book now! Our Dogs website has been online since 2000. With over 25,000 unique users & 100,000 impressions a month. The Our Dogs email newsletter goes out to well over 2,500 dog related subscribers each week. Click for special advertising rates! We have a huge reach of over 103,000 follows on our facebook page. And over 12,100 people follow us on Twitter. Our Dogs is 'the real dog paper for real dog people' and is seen by top breeders, handlers, judges & show organizers in the UK and throughout the world each and every week! Where Will My 'Ad' Be Seen? After placing an advert with Our Dogs, it will be made available to all our weekly subscribers, via high street newsagents & to all our online members on the website. If you want to get your product out there to the right type of customer we can help you target that audience. If you want to let others know about your latest show win this is the place to do so. And for show organizers wanting to get the word out on your up & coming show there's no other place to do it! OUR DOGS video unit will visit your stand at the start of the show to promote your brand/ stand or new product. If you would like any advise?